I would share some of the beautiful flowers. The flowers were done by the inimitable Shelley from Bow Street Flowers. The centerpiece on the buffet table. On the right is the top layer of the cake with its sugar orchids. My favorite was the bride's nosegay. Isn't it beautiful? The fall flowers are also all across the city. Our urban garden center has switched seasons almost overnight. 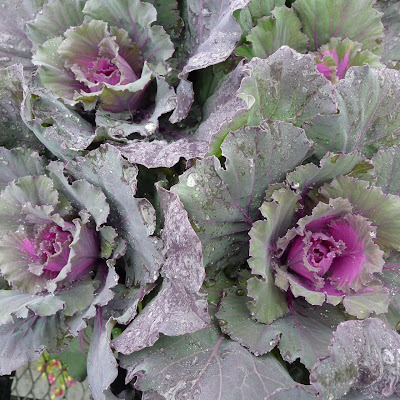 ...and a large variety of cabbages and ornamental kale. I have the whole place to myself. It's almost like a walk in the country. I'm sure there are plenty more fall flowers at Jane's party. The pumpkins and flowers in the rain are beautiful . . . The brides nosegay is STUNNING! Congratulations to your friends, and and to Shelley on her beautiful flowers. I just love the subtle shades and wonderful textures of the nosegay. Those wedding flowers are lovely. 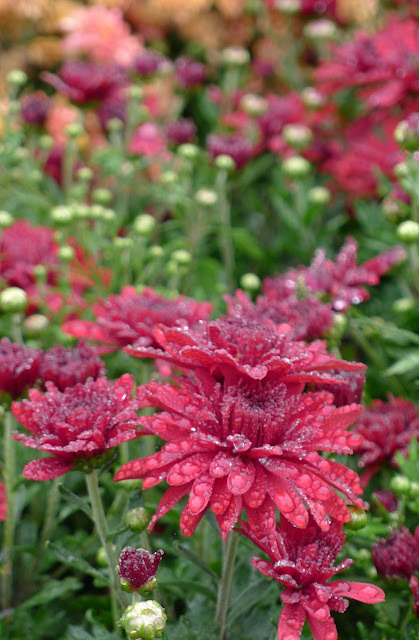 I love potted mums outdoors in the Fall but I can never find the red ones where I live. Shelley always gets it right! 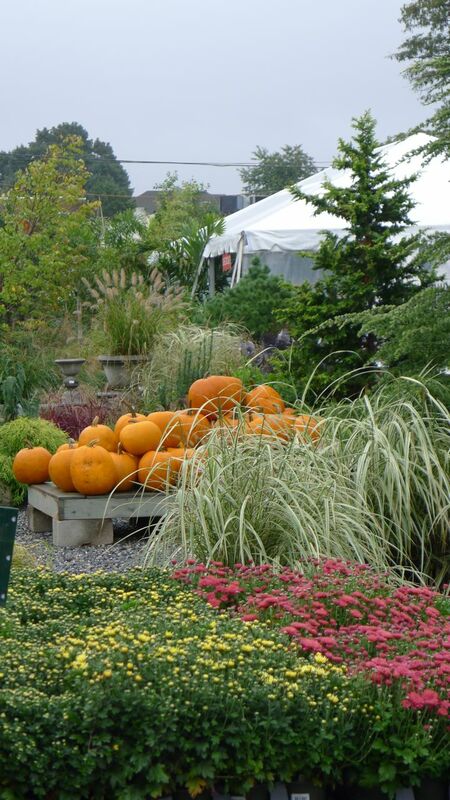 Your garden center pictures are beautiful--you have really captured the beauty of autumn. Both soft and crisp. A sure sign of fall when the fall flowers and pumpkins arrive in the city! I'm looking for mine this week. Enjoy the beginning of this wonderful season. Well this just put a big smile on my face. What fun for you, you had connections all around you on Saturday. And your autumn in the rain pics are beautiful and make me wish it was gently raining here so I didn't have to go out and water. Was going to rave about the white pumpkins until I saw the mums in the rain - what a great photo. Hope that bride realizes how lucky she was to have Shelley. Thoughtful of you to share with us tho, Shelley doesn't do it often enough! Enjoy getting ready for fall around your house! Everything is so pretty...the flowers from the wedding and the seasonal mums and pumpkins and grasses...I do love this time of the year. I also love to go the nursery in the rain...Everything looks so pretty with raindrops and it's so peaceful. 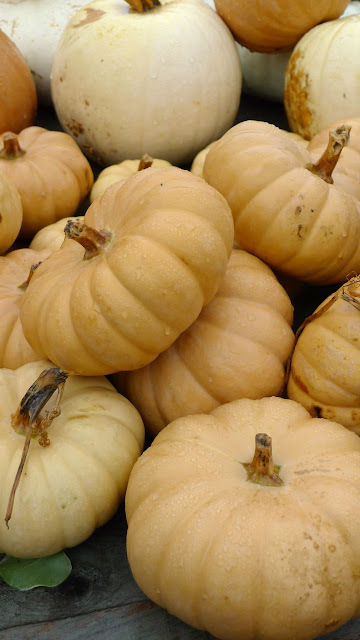 I do miss pumpkins in Autumn. Of course we can buy them here but not in large Autumnal displays. What were those lush white little flowers in the gorgeous nose gay? All your photos are wonderful, it is hard to pick a favorite although the sea of mums really makes me smile and think of autumn. Oops forgot, love the pumpkins! Yes this is why I love fall! How I love flower photos! Thanks for sharing your wonderful ones with us. Lovely images. 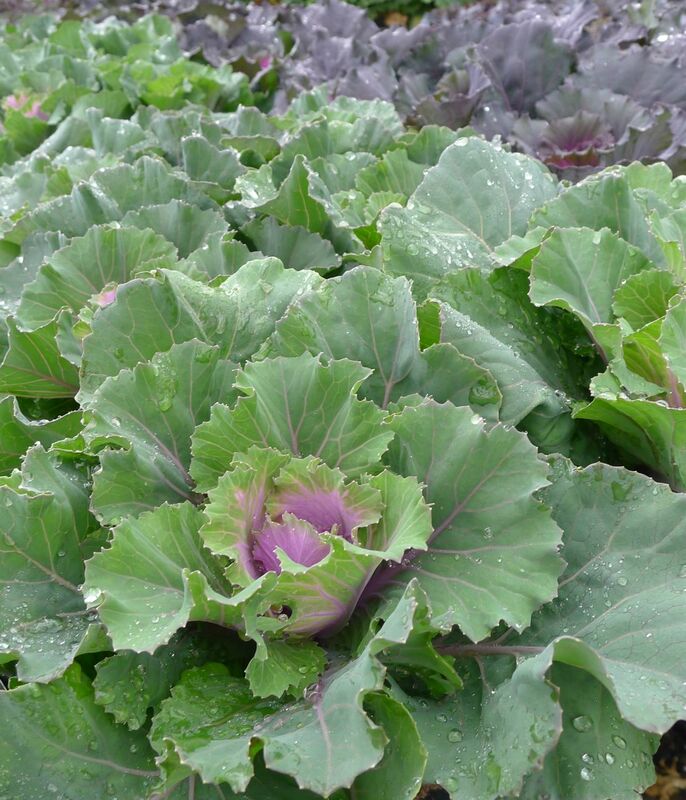 A close-up of that lavendar cabbage center would make a great Georgia O'Keefe painting. 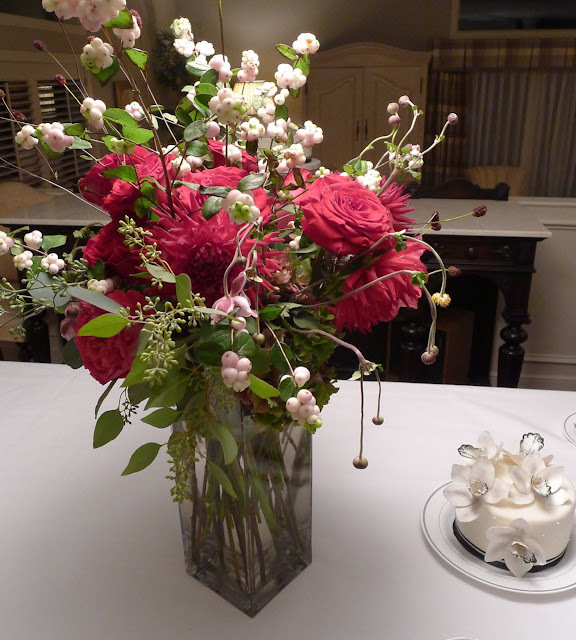 Beautiful flower arrangements! I was in Pennsylvania over the weekend and bought lots of pumpkins.....white ones, of course :) Going to get some white mums this weekend! Those wedding flowers are gorgeous, leave it to Shelley. The nosegay is spectacular. 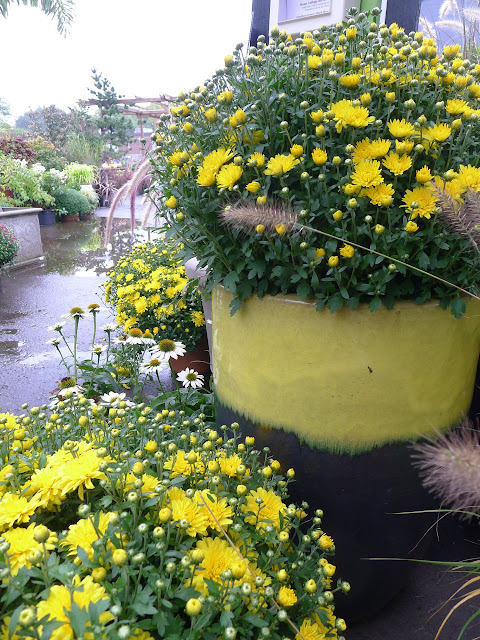 Just this morning I was thinking that I have to get to the garden center for Fall mums and your pictures are pushingme out the door. Lovely, lovely, lovely! Especially the bride's nosegay and that fabulous unblemeshed decorative cabbage. 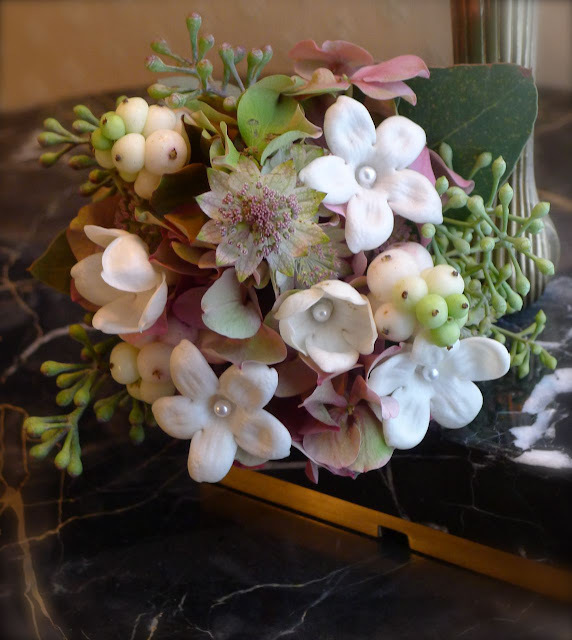 Stunning wedding flowers - just so detailed and exquisite. Steve! you took good photos of the flowers: mine were crap. Thanks for posting them! Is that Pemberton? You've launched us into Fall for sure! Those bridal flowers are so beautiful-- so artistic, so unexpected and lovely. So NOT what everyone else does! Your friend Shelly is truly talented. Thanks for letting us see her work. Now, as for your photography -- unbelievable! Again. The composition of the pumpkin shot is so utterly perfect. And the rain shot of the flowers, and then the cabbage. Really, Steve, it is such a pleasure to see your images. 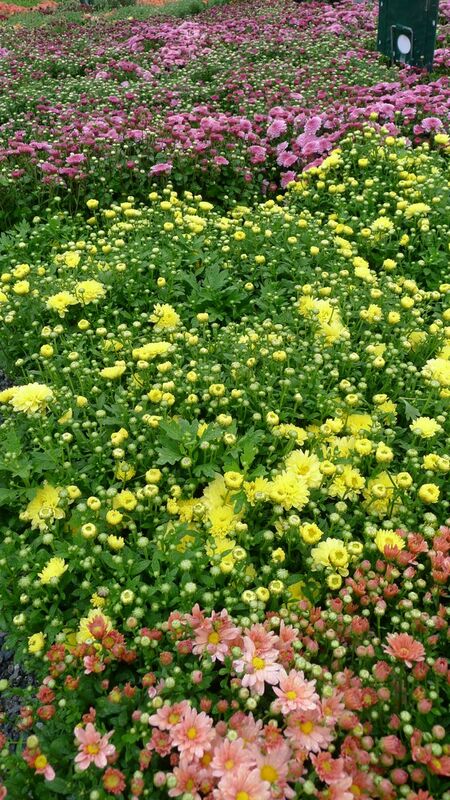 I love the "carpet" of mums....very pretty. Looking forward to seeing your bedroom redo when you are finished. Ditto to every single word that Carol wrote. The bride's nosegay is stunning. Perfect for a fall wedding. I could spend all day poking through the garden center. I am in love with the adorable flowers and berries in the first photo - the same as the bride's nosegay! Can you name them for us? I love all of your photos, they are so beautiful. 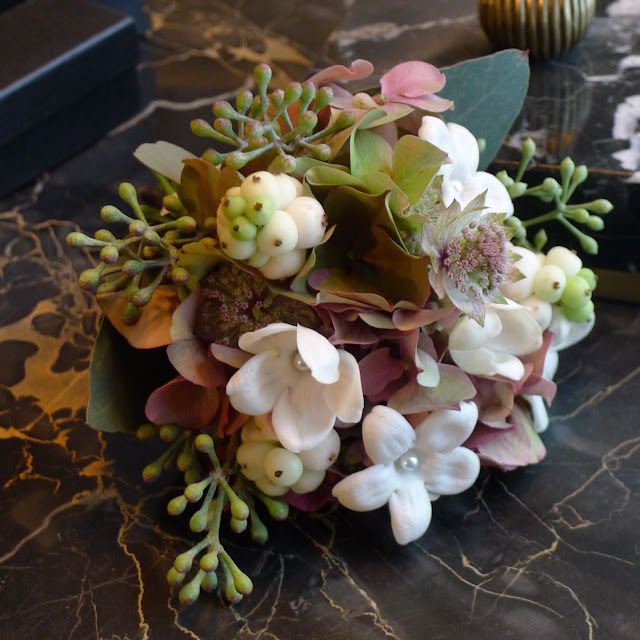 I did check out the florist's blog as well! 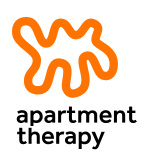 Love your blog, thank you so much! That must have been some wedding cause those flowers are pretty dang fabulous. So it's fall.....better yank out the dead summer flowers and get busy. I know I've visited here before Steve and I came back compliments of FITH party (which Annie introduced me to) - hope to join in one of these days. 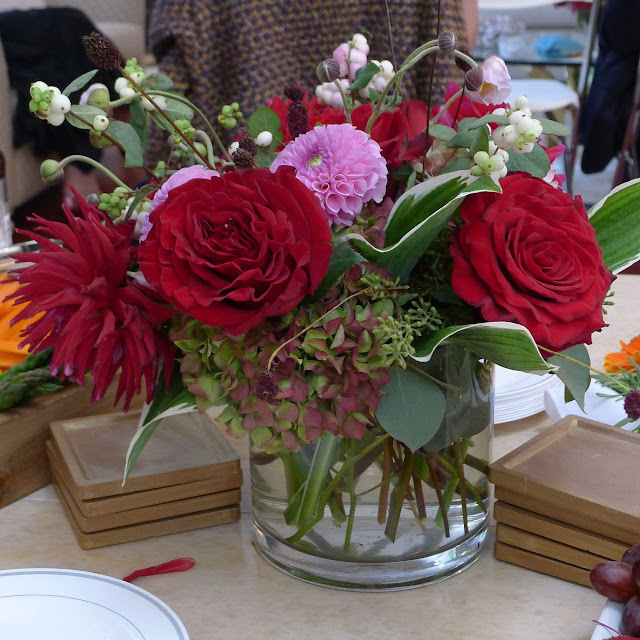 Beautiful flowers at your friends event. your house is so beautiful!! and so is your blog - had so much fun reading it the past hour. Adding you to my blog roll. thanks!!! Don't tell my daughter, but I've started a file of wedding ideas, should she ever decide to go there, and this bride's nose gay is going in it! I agree.... that nosegay is spectacular! Looks like it was a beautiful wedding. What a pretty wedding that had to be. The wedding flowers are simply gorgeous. So different than the norm - and so stunning. Gorgeous flowers, beautifully photographed. Bow Street does Excellent work! I'm with you on the nosegay, beautiful. White flowers with a heart of pearls, what a beautifully creative idea, I have never seen that before, it makes a very special nosegay. Love the cabbage and pumpkins! Perfect for this time of year! Love the flowers Shelley did, the snowberries are lovely. What gorgeous fall flowers! Stunning centerpiece and nosegay! Guys like nice houses, too! While out on a walk in my Boston area neighborhood, I came across an 1842 Greek Revival cottage for sale. I immediately fell in love with the possibilities. Join me on my journey of imagining all the possibilities while I renovate and furnish my cottage in the city. 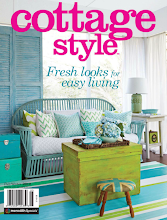 Copyright: Urban Cottage 2010-2015. Simple theme. Powered by Blogger.